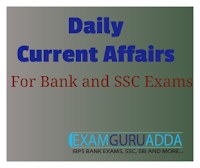 Dear Readers, we are presenting Daily Current Affairs for All Exams- 3rd December 2016. 1. A 16-year-old Indian environmental activist based in the UAE has won this year’s prestigious International Children’s Peace Prize for her fight for climate justice and combating environmental degradation. 2. Kehkashan Basu was presented the award by Bangladesh’s Nobel peace laureate Mohammad Yunus at a glittering ceremony in The Hague. 3. Yunus, who won the Nobel Peace Prize in 2006 for his efforts for economic and social development, underlined the urgency and importance of Kehkashan’s work, as more than three million children under the age of five die every year from environment—related diseases and many more suffer deeply from environmental issues. 1. The International Day of Persons with Disabilities (IDPD) 2016 was observed across the world on 3 December 2016. The theme for the day was Achieving 17 Goals for the Future We Want. 2. In 2016, the goal of the IDPD is assessing the current status of the Convention on the Rights of Persons with Disabilities (CRPD) and SDGs. The day also looks forward for laying the foundation for a future of greater inclusion for persons with disabilities. 1. The National Pollution Control Day 2016 was observed on 2 December 2016 in India with an aim to make aware the people and industries about the need of Pollution Control Acts. 2. This day is observed every year to give honour to thousands of human beings who lost their lives in 1984 due to the Bhopal gas tragedy and who were left severely affected due to leakage of poisonous gas from Union Carbide plant in Bhopal. 1. Thailand named its crown prince Maha Vajiralongkorn as its new king on 1 December 2016, 50 days after the passing of King Bhumibol Adulyadei. 2. Dressed in white, prince Vajiralongkorn ascended the throne and accepted his new responsibilities at the invitation of the National Legislative Assembly’s (NLA) President in his Bangkok Palace amidst the whole of Thai media. The ceremony was attended by several senior officials like the chief of NLA, Prime Minister Prayut Chan-o-cha and the head of the privv council, Prem Tinsulanonda. 1. The Hornbill Festival began in the Naga Heritage village of Kisama. The festival coincides with the Statehood Day of Nagaland which is observed on December 1. 2. It is tourism promotional extravaganza to revive, protect and . preserve the richness and uniqueness of the Naga heritage. It is also called as the ‘Festival of Festivals‘. 1. The Union Government has given senior IPS officer Rakesh Asthana additional charge of the post of Director, Central Bureau of Investigation (CBI). He took charge following retirement of Anil Sinha. 2. He was given this charge after government failed to find any full-time Director for CBI. This is the first time in last 10 years and only the second time in the CBI’s history that no new Director has been named to succeed an incumbent.